There are a variety of factors that go into choosing flooring for home from the durability of the material to the specific style. You want a flooring material that will please and benefit you and your family for years to come. Slate tiles are a popular choice of flooring amongst homeowners in recent years for its strength and beauty. Once you install slate tiles into your home, you will reap the never-ending benefits almost immediately. Slate is one of the strongest and long lasting materials to install as flooring in your home. It is stand up well to heavy foot traffic so it is the perfect option for a large household or if you constantly have guest over to your home. Slate is resistant to cracks, scratches, and chips, so it is simple to care for and to retains its beauty. Besides occasional sealing, slate requires very minimal maintenance so it will last for many years to come. One of the most attractive qualities of slate is that is resistant to stains and moisture making it the perfect material to install in your kitchen and bathroom. Slate is the wisest option to install in your kitchen because it is the space most susceptible to messes and stain. Fortunately, you won’t have to spend much time cleaning your slate flooring after cooking a large meal. Slate flooring is perfect for installing in your bathroom because it will be unaffected by all the moisture in the room. 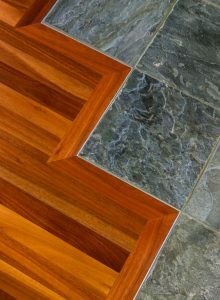 There are a variety of color options to choose from when planning your slate flooring. You can go as simple or as intricate as you want with single to multi-color options available. Each piece of slate is unique and consists different composition of natural materials. This entry was posted on Friday, October 27th, 2017 at 12:50 pm. Both comments and pings are currently closed.